TRAGIC ENNIS TEENAGER Jack Dinan became a Dad for the first time on Tuesday – one day after his missing body was discovered. At Jack’s funeral mass at St Joseph’s Church in Ennis today, Jack Dinan’s sister Jade Dinan told mourners that baby Keelan Jack was born on Tuesday of this week. 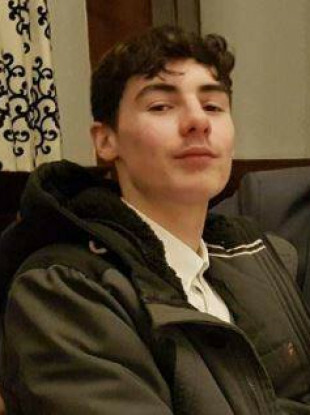 The previous day, Jack Dinan’s body was found in a wooded area outside Ennis six days after Jack disappeared from his home last Tuesday week at 10am armed with a rifle taken from his home. In an emotional address at the end of the mass, Jade also made a plea to those feeling alone or lost to seek help. “The pain of suicide is something I would never wish on another family,” she said. Jade told mourners that Keelan Jack “was born on 7 November and we are so, so grateful for this gift Jack has left behind”. Jade said that Keelan Jack “will always help us to remember Jack and it will make the pain a little easier”. In a separate message from the Dinan family read out at the start of the mass, Father John McGovern also referred to the birth of baby Keelan Jack three days ago. Father McGovern said that Jack Dinan’s girlfriend Shanara gave birth “to this beautiful little boy and that name Jack will continue on and be remembered in his name”. “Jack was so in love with Shanara – they were inseparable. If there were more hours in the day he would have spent them with her,” Father McGovern said. Jack’s family are so grateful to Shanara for the love she shared with him and for keeping the memory and life of Jack alive in the form of her son’s name, Keelan Jack. The funeral mass for the 19-year-old was the first of two masses for the young victims of suicide to take place in Ennis today with the second mass at lunchtime concerning a woman in her early 20s. Jade then asked mourners to make a small donation at the mass to suicide awareness charity, Pieta House “to help prevent this from happening to other young people and their families in future”. Jade said that her brother Jack was such a good person, kind and gentle. It broke our hearts this past week searching for you day and night but now we have you back. “I wish there was more I could have done to ease your pain,” she said. In an address that received sustained applause during a standing ovation, Jade also thanked everyone involved in the relentless search for Jack stating “we will never know how to repay you”. In his message from the family, Father McGovern said that the family say “our hearts may be torn, but our love for Jack will never be lost or broken”. He said that Jade was a minder to her baby brother from an early age and that Jack Dinan became a guardian for his younger sister, Taylor. “Jack would always look out for Taylor – she was his little angel and now he is Jade’s and Taylor’s angel,” he said. Symbols of Jack Dinan’s life were presented at the altar including gloves which symbolise his thoughtfulness to others and his camouflage hunting hat, which symbolises his love of hunting and time spent with his father, Patrick. He was later laid to rest at Drumcliffe cemetery outside Ennis. Jack Dinan is survived by his parents, Patrick and Lorna, sisters, Jade and Taylor and girlfriend, Shanara. Email “'Our love for Jack will never be lost': Tributes paid at funeral of missing Ennis teenager”. Feedback on “'Our love for Jack will never be lost': Tributes paid at funeral of missing Ennis teenager”.